Whitbread is a large UK hospitality business with major lines of business in coffee shops with Costa Coffee, in hotels with Premier Inn and in restaurants with Beefeater, Table-Table & Brewers Fayre restaurant brands. 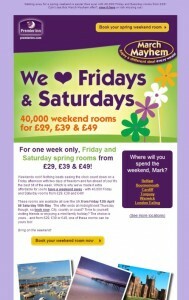 Premier Inn is the UK’s largest hotel brand with over 650 sites throughout the country. 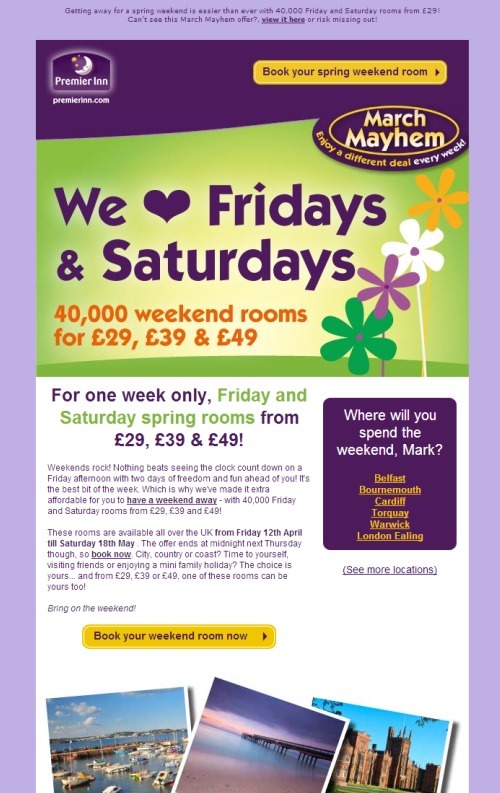 As a budget hotel brand, Premier Inn’s pricing is low with consistently effective promotional activity driving visits and bookings online, to contribute to relatively high hotel room occupancy in the UK hotel sector. 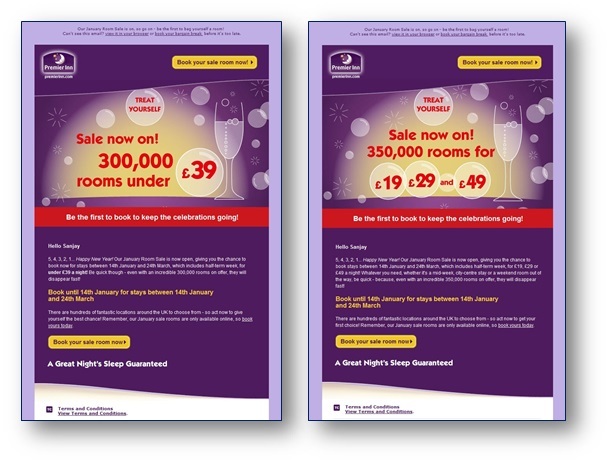 Operating almost as an ecommerce business, more than 80% of hotel bookings for Premier Inn take place online. Customer database marketing to data gathered from enquirers and ‘stayers’ driven predominantly from clickthrough to targeted email promotions contributed about 8% of bookings so 1 in 10 online bookings. However Premier Inn was guilty of overdoing email marketing to a core marketing database of 3 million records with the same generic offer every week – “Do you want to book a hotel room this week?” With very basic measurement and reporting in place, there was a clear need to better understand drivers of demand & audience segments, together with a real opportunity to match demand to available hotel room inventory. Getting closer to the commercial ‘trading performance’ of the business showed that Premier Inn had clear commercial needs which varied from week to week. Matching gaps in occupancy by site and region, as well as by date could show us where to ‘place’ demand rather than risking offering what we didn’t have to sell. So we agreed an approach based on working hand in hand with the hotels revenue management team who set prices, built offer pricing and loaded room inventory. Instead of selling hotel rooms our approach would place demand where the business needed it. We worked hard to devise, agree and plan a ‘trading calendar’ populated at first with opportunities to promote seasonally from obvious anchor points such as Christmas, Easter, school holidays, bank holidays; to less obvious ones like Valentines Day, sporting occasions and national events. Whatever gaps were left we filled with city breaks at first, and with a series of ‘Top ten hotels for xxxx’ promotions later. Secondly we adopted a ‘test and learn’ mentality, measuring everything, and always running test versions of promotional messaging against what our experience told us would work. We started to write up and publish our learnings and act on our conclusions. Plus we tried hard to make our communications more engaging, with copy full of character and visuals which would catch attention. In parallel we reviewed who we could reach through the data we held, with quickwin conclusions to be able to engage with more of our current and prospective customers to grow the reach of our marketing database. Within weeks we’d established growth in web visits, bookings and revenue year on year. Within months we’d stabilised our year on year growth at +70%, and 18 months later we were sustaining it. Plus we grew the overall database to over 4 million records, but started to change messaging to ‘non-openers’ inviting their feedback to try to re-engage with them. Just as importantly we grew open rates, click rates and conversion rates showing that our messaging had become far more effective and appealing. With +70% growth sustained for so long we grew the scale of bookings and revenue from customer marketing from 8% of all bookings to over 15% – growth in directly tracked revenue worth over +£70m per year to Premier Inn. 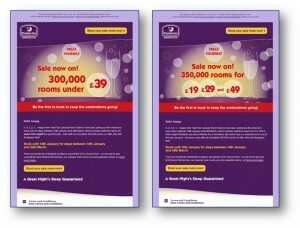 To read another case study about Premier Inn Click here. Or to read another case study about marketing driving business growth Click here. Or to get in contact Click here.